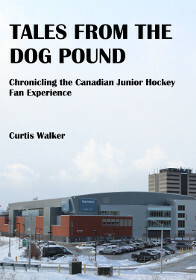 Tales from the Dog Pound chronicles the Canadian junior hockey fan experience featuring the Ontario Hockey League's Niagara IceDogs. Included are many off-color observations in the stands along with stories and pictures from several fan bus trips. Also highlighted is the dedication of the junior hockey fan base, which is fanatically loyal to a fault and fiercely protective of the boys in uniform. For the paperback edition, click here.